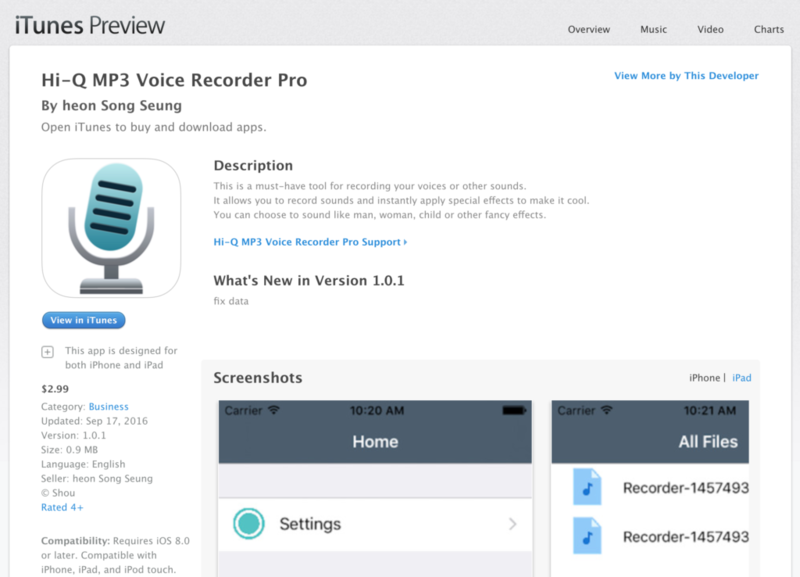 The name of the app is taken from ours: Hi-Q MP3 Voice Recorder Pro. The icon is exactly the same as ours. The publisher is “heon Song Seung”, a name of a Korean actor. The UI is completely different than ours and very simplistic. We have contacted Apple for removal of the aforementioned app since it infringes our trademark and copyright. Please contact Apple if you have bought that app from the iTunes Store for cancellation or refund. The official Hi-Q MP3 Voice Recorder can be obtained only for Android at the following links: Free trial version, Pro version. Note: It is disappointing to know that Apple App Store approval process did not filter out such submission. This is the second time this happened. The first one happened on Aug 2016 when the same fake app appeared (same name, icon, and screenshots) and published by “Prisma bible Nguyen”, Apple ID of the app “1120553159”. Thank God I found this. I was going to purchase this app for my ipad, since I have it on my Droid. Please develop one for the Ipad….